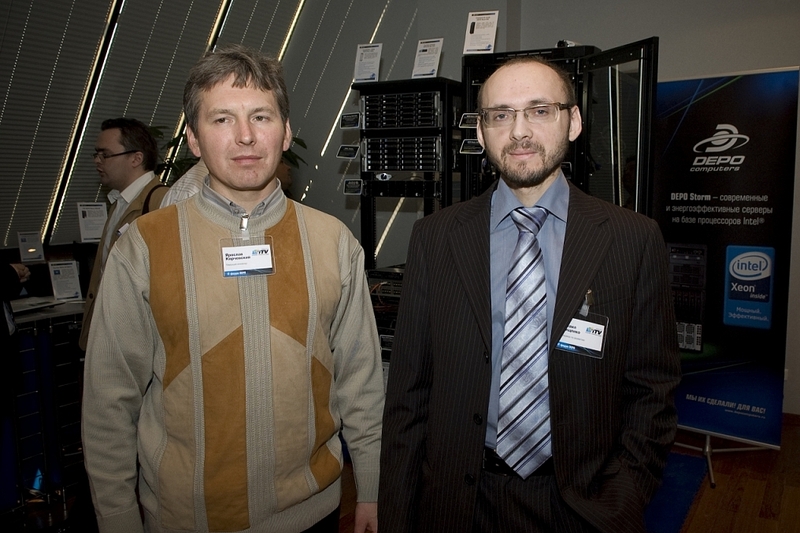 On the ninth of April 2009 DEPO held its «IT-infrastructure 2010» IT-forum at the World Trade Center in Moscow. The forum was aimed at providing IT executives with a professional environment for networking, incentives to learn about the latest technologies from IT-industry leaders and sharing experiences. The event paved the way to explore a whole range of issues at the cutting edge of computer technology. IT giants such as Intel, Microsoft, Cisco, VMWare, NVIDIA shared the floor with DEPO Computers and AxxonSoft. Within the framework of a round-table discussion «Distributed and parallel computing. Computer clusters and Supercomputers» Mikhail Onischenko, AxxonSoft product development manager, introduced a brainchild of AxxonSoft, NVIDIA and DEPO Computers for automated workstation (AW) monitoring. This solution includes a DEPO computer platform with installed AxxonSoft software for AW monitoring. Video data in different formats, such as MJPEG, MPEG-4, H.264 and Motion Wavelet, is handled by NVIDIA CUDA know-how. This technology brings into action computing resources of a video output card (GPU) and TESLA computing accelerators, produced by NVIDIA and so reduces CPU usage. The audience welcomed the novelty with keen interest as CUDA boosted the efficiency of video stream processing by more than fivefold. This NVIDIA development empowers contingency centers with higher capacity at each computer platform and outperforms CPU based video processing techniques. «We’d like to note the diversity of solutions, introduced at the seminar. We were eager to see the developments of the market leaders. DEPO Computers are to be commended for arranging a flawless seminar hosting major players in computer and IT technologies,» – emphasized Mikhail Onischenko. «I really appreciate the organizational effort that went into the event. One also cannot but feel the spark of interest of the audience toward the solutions, introduced by us and our partners. My special credits to AxxonSoft for taking part in the forum. Our colleagues did a highly professional job by making the advantages of our joint solution easy to understand. I’m positive that this product will open bright new horizons,» – noted Viktor Urusov, DEPO corporate solutions director. For AxxonSoft it is just foundation work. CUDA will soon take care of not only video stream decoding, but also video analytics and post processing of video data for display. The next release of AxxonSoft Intellect 4.7.6 is already due to accommodate this technology. DEPO Computers – is the largest developer, producer and supplier of computer systems in Russia. It has been in the IT-market since 1994. The company produces a broad range of computing machinery under the DEPO trade mark – from specialized server solutions to laptops. DEPO Computers provides all the related IT services – from design to start-up and service of IT- infrastructure and comprehensive solutions. DEPO serves 95% of the Russian TOP 500 companies. NVIDIA is the world leader in visual computing technologies and the inventor of the GPU, a high-performance processor which generates breathtaking, interactive graphics on workstations, personal computers, game consoles, and mobile devices. NVIDIA serves the entertainment and consumer market with its GeForce® products, the professional design and visualization market with its Quadro™ products, and the high-performance computing market with its Tesla™ products. These products are transforming visually-rich and computationally-intensive applications such as video games, film production, broadcasting, industrial design, financial modeling, space exploration, and medical imaging.